Fuso has moved the hybrid concept up into the long-haul ranks with the new Super Great HEV model. 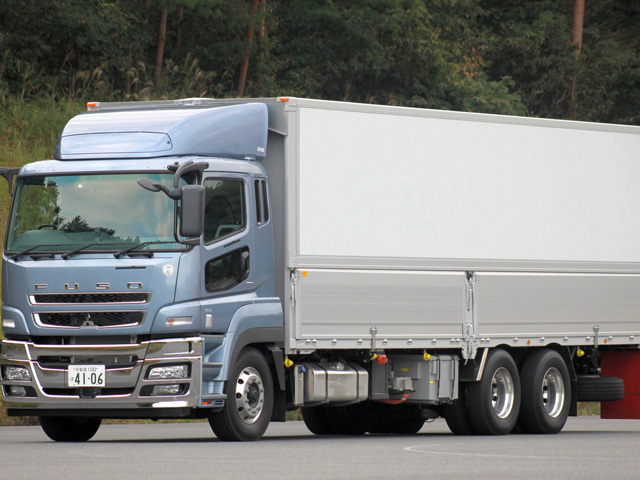 Commercial vehicle manufacturer Fuso, a member of the Daimler group, has introduced a heavy-duty hybrid truck in Japan with first tests of the Super Great HEV demonstrating significant fuel efficiency improvements over conventional diesel-only vehicles on long haul routes. The significance of this development lies in the fact that conventional thinking has leant towards hybrids being best suited to short-radius distribution operations since such operations involve many stop-start situations. In this way, braking energy can be continuously recaptured. Heavy-duty highway trucks in long-haul operations have not generally been regarded as suitable for hybrids. “Evaluation so far shows that hybridisation can indeed benefit heavy-duty trucks in typical long-haul operations,” explains Gustav Tuschen, Fuso’s vice president of product engineering. According to Tuschen, the hybrid system of the Fuso Super Great is optimised so it can capture energy even when the truck is going down slight grades. The parallel hybrid system ensures that energy loss is minimised. His confidence is borne out by the results of the first tests performed under real-life conditions which showed an impressive increase in fuel efficiency by as much as 10% versus conventional diesel-only powered vehicles. Testing was conducted on motorways in Japan in representative conditions. The hybrid heavy-duty truck development is a further milestone in the development efforts of the Global Hybrid Center (GHC) located in Kawasaki. The development centre synchronises and controls Daimler Trucks’ global hybrid activities. The newly developed hybrid heavy-duty truck is based on the technology of the Canter Eco Hybrid of which around 1 200 units have been sold since it was introduced in 2006. This model was recently seen in South Africa on the Mercedes-Benz Commercial Vehicles stand at the Johannesburg International Motor show. The Fuso Super Great HEV now being presented in Japan features a conventional diesel engine; electric motor/generator; lithium(Li)-ion battery and related control software. It utilises a parallel hybrid system. That means power to drive the vehicle comes from the vehicle’s electric motor, the diesel engine or both. Fuel efficiency and emissions reduction are achieved by using them singly or in combination with each other according to driving conditions. When slowing down or braking, the electric motor functions as a generator to brake the vehicle. The generator converts brake energy into electric energy and returns it to the lithium-ion battery. Based on the positive test results, Fuso is now moving ahead with development of heavy-duty hybrid trucks. The key challenge now is to ensure significant overall lifecycle cost benefits for the Super Great HEV. One focus of work is to minimise the weight of the hybrid system so the customer has the highest possible payload at his disposal. Bringing down the initial purchase price will no doubt also be a challenge for this has been mitigating against wide-spread acceptance of the hybrid in urban operations in overseas markets.